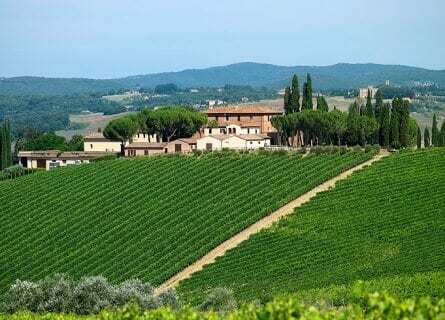 Brunello di Montalcino is one of the most famous and evocative names for wine collectors, and this Tuscan village itself is a sheer delight to visit. Montalcino has an aristocratic pedigree and was already famous for its red wines in the 1400s, and it is even today considered to be one of Italy’s “Noble wines”. We have organized these luxurious Mercedes chauffeured routes just for Brunello lovers who would like to taste these mythical wines right where they are made. These excursions can be taken from Florence or Siena, Siena being more convenient. Enjoy your own private wine tour with Cellar Tours on your next visit to Tuscany! In the morning your private chauffeur and luxurious Mercedes will collect you at your hotel in Florence or Siena. You will transfer through the stunning Tuscan countryside, enjoying the idyllic rolling hills, medieval towns, and cypress-lined roads. First up is a private and very special visit to a top winery in Montalcino, such as the mythical Altesino estate. Your hosts will greet you warmly and you will visit the beautiful cellar, enjoy the fabulous views and of course taste a range of their best wines, from Rosso di Montalcino to the high-end Brunellos. Follow a delightful visit with an intimate lunch right at Altesino’s wine estate. The dining experience is five star, the food is traditional and home cooked and the experience is one to remember. After your relaxed lunch with your charming hosts, you will take in a second private visit to a top estate in Montalcino, to a prestigious Brunello producer like Il Palazzone. Taste a wide range of wines including Riservas and special vintages, all on a VIP tour. After a hard day’s wine tasting, we’ll change the pace and get a spot of culture! Visit the gorgeous Abbazia di Sant’Antimo, one of the oldest Abbeys in Italy and one shrouded in mystery. There is a legend involving Charlemagne the Holy Roman Emperor who back in the year 800, upon his return to Rome, decided to set up camp on the location where we now have the Abbey. His soldiers were struck by the plague in the middle of the night when an angel appeared and instructed Charlemagne to make an infusion of the holy grass and some wine (Brunello?) and give it to the soldiers. “Carlo Magno” as he is known in Italian, declared that an abbey be built right on that spot to glorify the miracle. Brunello producers’ propaganda? Who knows, but the abbey is just gorgeous and you can take in a nice digestive walk after your gourmet food and wine experience today. Transfer back to Siena and this will conclude your day excursion of Montalcino, with Cellar Tours. Our vineyard tours in Brunello di Montalcino were both spectacular. The visit to Il Paradiso Di Frassina was wonderful. Carlo Gigniozzi could not have been more gracious. We particularly enjoyed his philosophy that wine types should not be “flat,” but orchestrated, to reveal layers of complexity, harmony, and individuality. The visit to Poggio Antico was very different, yet every bit as memorable, from the perfectly prepared Medicean dinner with its eight courses and six wines to the panoramic view to the exemplary table service and presentation of the wines to the enthusiastic and informative tour of the cellars.